میرنصوری, رحیم, طاهرپوری, طیبه, محمدی, مجید, احمدی, گیتی. (1396). تأثیرفعالیت‌های آمادگی جسمانی بر ارتقاء سلامت عمومی دانش‌آموزان مقطع ابتدایی شهرخرم‌آباد. 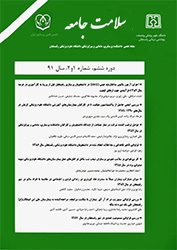 سلامت جامعه, 9(4), 18-27. رحیم میرنصوری; طیبه طاهرپوری; مجید محمدی; گیتی احمدی. "تأثیرفعالیت‌های آمادگی جسمانی بر ارتقاء سلامت عمومی دانش‌آموزان مقطع ابتدایی شهرخرم‌آباد". سلامت جامعه, 9, 4, 1396, 18-27. میرنصوری, رحیم, طاهرپوری, طیبه, محمدی, مجید, احمدی, گیتی. (1396). 'تأثیرفعالیت‌های آمادگی جسمانی بر ارتقاء سلامت عمومی دانش‌آموزان مقطع ابتدایی شهرخرم‌آباد', سلامت جامعه, 9(4), pp. 18-27. میرنصوری, رحیم, طاهرپوری, طیبه, محمدی, مجید, احمدی, گیتی. تأثیرفعالیت‌های آمادگی جسمانی بر ارتقاء سلامت عمومی دانش‌آموزان مقطع ابتدایی شهرخرم‌آباد. سلامت جامعه, 1396; 9(4): 18-27. مقدمه: تلاش برای بالا بردن سطح سلامت دانش‌آموزان و کمک به تحقق اهداف نظام آموزش و پرورش ضروری است. لذا هدف از انجام پژوهش حاضر بررسی تاثیر فعالیت­ های آمادگی جسمانی بر ارتقاء سلامت عمومی دانش‌آموزان مقطع ابتدایی شهر خرم ­آباد بود. مواد و روش­ ها: در این مطالعه نیمه تجربی، تعداد 100 نفر دانش ­آموز مقطع ابتدایی از طریق نمونه­ گیری در دسترس به عنوان نمونه آماری انتخاب، و پس از تکمیل پرسشنامه جمعیت شناختی و سلامت عمومی گلدبرگ (1972)، به طور تصادفی به دو گروه کنترل و مداخله تقسیم شدند. سپس گروه مداخله، به مدت 12 هفته تمرینات آمادگی جسمانی را انجام دادند. پس از اتمام برنامه تمرینی، مجدداً پرسشنامه سلامت عمومی، توسط نمونه ­ها تکمیل و گردآوری شد. داده­ های بدست آمده توسط آزمون­ های t زوجی و مستقل مورد تجزیه و تحلیل قرار گرفت. یافته­ ها: فعالیت­ های آمادگی جسمانی باعث ارتقاء سلامت عمومی دانش ­آموزان در مؤلفه ­های نشانه­ های جسمانی (003/0p=)، اضطراب و اختلال خواب (009/0p=)، اختلال درکارکرد اجتماعی (001/0p=) و افسردگی (001/0p=) شد. نتیجه­ گیری: با توجه به نتایج این پژوهش، می­توان از فعالیت­های آمادگی جسمانی به عنوان مداخله­ا ی سومند در جهت ارتقای سلامت عمومی دانش­ آموزان استفاده کرد، لذا مدارس که نقش مهمی در امر آموزش دانش ­آموزان دارند می ­توانند با بهره ­گیری از این تمرینات به کودکان در جهت رسیدن به این مهم کمک کنند. 1Assistant prof. Dept. Physical Education, University of Lorestan, khorramabad, Iran. Introduction: Efforts to improve the health of students and thus contributing to achieving the goals of the educational system is very necessary. The aim of this study was to evaluate the effects of physical fitness activities on promoting the public health in primary school students of khorramabad city. Materials and methods: For this purpose, among the 38,633 elementary school students, 100 available cases were selected. After completing the demographic and general health Goldberg questionnaire (1972), the students were divided into control and experimental groups randomly. Then the experimental groups completed fitness exercises for 12 weeks according to pre-determined exercise programs. After completing the training program, general health questionnaire, were recompleted and collected by the samples. Data were analyzed using t-test. Results: That exercise and physical fitness followed the increase general health of students in components of somatic symptoms (p=0.003), anxiety and insomnia (p=0.009), social dysfunction (p=0.001) and depression (p=0.001). Conclusion: Sport can be used as a public health intervention to improve the student's productivity, therefore, the schools that play an important role in students teaching, can help to this aim with using physical training. Asgari P, Roushani,Mohri AM. The Relationship between Religious Belief, Optimism and Spiritual Well Being among College Students of Islamic Azad University 2009;4(10):27-39. [Persian]. Ortega FB, Artero EG, Ruiz JR, Vicente-Rodriguez G, Bergman P, Hagströmer M, et al. Reliability of health-related physical fitness tests in European adolescents. The HELENA Study. International journal of obesity 2008;32:S49-S57. Ekblom Ö, Oddsson K, Ekblom B. Physical performance and body mass index in Swedish children and adolescents. Scandinavian Journal of Nutrition/Næringsforskning 2005;49(4):172-9. Casasola CD. Analysis of heart rate during a tennis training session and its relationship with heart-healthy index. Journal of sport and health research 2010;2(1):26-34. Sekine M, Nasermoaddeli A, Wang H, Kanayama H, Kagamimori S. Spa resort use and health-related quality of life, sleep, sickness absence and hospital admission: the Japanese civil servants study. Complementary Therapies in Medicine 2006;14(2):133-43. Hoyt LT, Chase-Lansdale PL, McDade TW, Adam EK. Positive youth, healthy adults: does positive well-being in adolescence predict better perceived health and fewer risky health behaviors in young adulthood? Journal of Adolescent Health 2012;50(1):66-73. Calfas KJ, Taylor WC. Effects of physical activity on psychological variables in adolescents. Pediatric exercise science 1994;6:406-23. Guszkowska M. [Effects of exercise on anxiety, depression and mood]. Psychiatria polska 2003;38(4):611-20. McAuley E, Marquez D, Jerome G, Blissmer B, Katula J. Physical activity and physique anxiety in older adults: fitness, and efficacy influences. Aging & mental health 2002;6(3):222-30. Adams TB, Moore MT, Dye J. The relationship between physical activity and mental health in a national sample of college females. Women & health 2007;45(1):69-85. Iannotti RJ, Kogan MD, Janssen I, Boyce WF. Patterns of adolescent physical activity, screen-based media use, and positive and negative health indicators in the US and Canada. Journal of Adolescent Health 2009;44(5):493-9. Jerstad SJ, Boutelle KN, Ness KK, Stice E. Prospective reciprocal relations between physical activity and depression in female adolescents. Journal of consulting and clinical psychology 2010;78(2):268-72. Asztalos M, De Bourdeaudhuij I, Cardon G. The relationship between physical activity and mental health varies across activity intensity levels and dimensions of mental health among women and men. Public health nutrition 2010;13(08):1207-14. Dunton GF, Huh J, Leventhal AM, Riggs N, Hedeker D, Spruijt-Metz D, et al. Momentary assessment of affect, physical feeling states, and physical activity in children. Health Psychology 2014;33(3):255-63. Gopinath B, Hardy LL, Baur LA, Burlutsky G, Mitchell P. Physical activity and sedentary behaviors and health-related quality of life in adolescents. Pediatrics 2012;130(1):e167-e74. Hills AP, Dengel DR, Lubans DR. Supporting public health priorities: recommendations for physical education and physical activity promotion in schools. Progress in cardiovascular diseases 2015;57(4):368-74. Mesgharani M, Shafiee SH, Kiani N, Sadeghi M. Epidemiology mental disorders on students of Zahedan University of medical sciences. Teb and Tazkie 2004; 53: 84-88. [Persian]. PastorY,BalaguerI, Pons D, Garcı́ M. Testing direct and indirect effects of sports participation on perceived health in Spanish adolescents between 15 and 18 years of age. Journal of adolescence 2003;26(6):717-30. Knowles A-M, Niven AG, Fawkner SG, Henretty JM. A longitudinal examination of the influence of maturation on physical self-perceptions and the relationship with physical activity in early adolescent girls. Journal of adolescence 2009;32(3):555-66. Pourranjbar M. Effect of aerobic and non-aerobic exercises on anxiety. Journal of Kerman University of Medical Sciences 2006;13(1):51-6. [Persian]. Donohue B, Covassin T, Lancer K, Dickens Y, Miller A, Hash A, et al. Examination of psychiatric symptoms in student athletes. The Journal of general psychology 2004;131(1):29-35. Payne VG, Isaacs LD. Human motor development: A lifespan approach. 8nd ed .New York: McGraw-Hill; 2012:88.